PT EDMI Indonesia have opened a new factory in Cikarang, adding a half a million units to EDMI’s yearly production capacity and strengthened ties with PLN Indonesia. The factory is capable of making 3Phase and 1Phase smart meters. 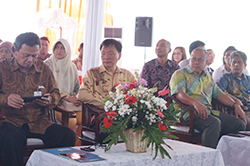 The new installation was opened on 5 March to a distinguished audience, including the Director of Planning and Development Affiliates PLN Subsidiaries of PLN Indonesia, Mr Murtaqi Syamsuddin and Mr Sortan Pulungan, representing the Directorate General of Leading and High Technology Based Industry as Head of Manpower and General Affairs. A delegation from the Embassy of Japan in Indonesia, headed by Mr Junji Shimada, Deputy of Mission, was also in attendance. Mr Murtaqi also stressed the priority of local manufacturing. “One condition is that we want local industry to be the first choice, not just imported, and to market the smart meter in Indonesia. [For this reason] EDMI manufacturing locally is most welcome,” he said. Mr Lee Kwang Mong, Group Managing Director of EDMI Limited, said the new plant will continue the good work of factories representing the Osaki Group in the region. “Indonesia is a very competitive market, and it is a big market; we have long term plans for working with Indonesia,” he said. 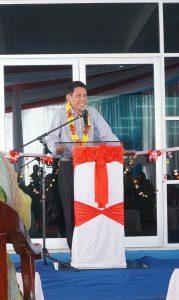 Mr Junji Shimada, Deputy of Mission of the Japanese Embassy to Indonesia, pointed to a bright future. “I believe that the man power resources and technology of EDMI and Osaki can answer the challenge of a better future by providing an extraordinary product, and services beyond expectations. I hope that all of parties involved now and into the future will build stronger relationships to achieve a beneficial, mutual relationship,” he said.